in Southern California. Women came from all over to attend this historic event, held at the California State University Dominguez Campus in Carson, California, in April 1987. Even before it was over, a group had begun planning for another. In August 1989, Lesbians in Northern California sponsored The Second West Coast Conference. Lesbian Organizing Committee (later renamed Old Lesbians Organizing for Change) was off and running. As was the case in the two conferences leading up to the inception of OLOC, participation was strictly limited to Lesbians 60 years of age and older. OLOC has, however, always welcomed the support of younger Lesbians, encouraging them to work against ageism while respecting the need for separate space for Old Lesbians. To minimize travel expenses for committee members, most meetings during the first two years were held in California. A concerted effort was then made to expand the geographic representation by moving the meetings around the country. Meetings were later cut from quarterly to twice a year, a pattern that mostly continues today. couldn't effectively speak for Old Lesbians and insisted that they themselves be allowed to represent Old Lesbians and their concerns. OLOC was a strong and highly visible part of the National Lesbian Conference in Atlanta in 1991 as well as the March on Washington in 1993. By 1992, OLOC sought and gained non-profit status, incorporating in the state of Texas. In 1994, OLOC also achieved tax-exempt status. These two steps cemented its legitimacy and made organizational fund raising through seeking grants and individual donations a little less daunting. In 1996, OLOC held its first National Gathering, bringing together Old Lesbians from coast to coast to the campus at the University of Minnesota in Minneapolis. Due to success of the Gathering the committee immediately began plans for the second Gathering. In 1999, hundreds of Old Lesbians gathered in San Francisco, CA. 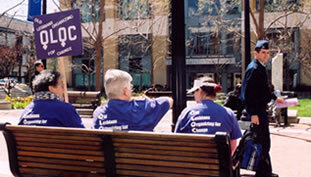 In 2002, OLOC held it's third Gathering, again in Minnesota. Old Lesbians expressed a strong desire for more frequent opportunities to get together, so the schedule was switched from once every three years to every other year. In 2004, the fourth National OLOC Gathering was held in Houston, TX. In 2006, the group convened in Durham, North Carolina. The 2008 Gathering was held in Los Angeles, California. The 2010 Gathering was held in the Midwest at Cleveland, Oh. In 2012, the Gathering moved to Boston, MA. The next National Gathering is going to the west coast at Oakland, Ca. in 2014. In addition to its informative quarterly newsletter called The OLOC Reporter, and biennial Gatherings, OLOC continues to confront ageism wherever it is found. Through a local Chapter/Group in Minnesota, OLOC produced a line of age-positive, women-friendly greeting cards. OLOC has also been a part of the Old Lesbian Oral Herstory Project, which strives to gather and document the unique stories of Lesbians 70 years of age and older. OLOC continues to act as a force for change, both as a national Organization and through individual chapters that have formed across the country, each bringing its own unique blend of talent, ideas and energy to OLOC’s efforts.